1968 DVD About the year Gift card. << Back 1968 DVD About the year Gift card. This DVD GiftCard includes a DVD containing an exciting, exclusive documentary featuring the top news, events and personalities of the year along with fascinating period bonus items. 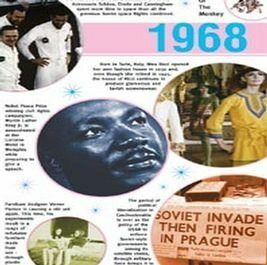 The original documentary footage has been compiled from the archives of British Pathe and ABC News America and makes this an ideal card and gift to give anyone for whom 1968 was a special year.